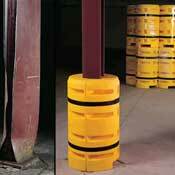 Column Sentry Cushion - Tempo Safety Compliance & Supply, Inc. Column Sentry 12S cushions those big bumps, preventing expensive column damage. - Column Sentry nest within the column flanges, eliminating side slip when hit from any angles.